We offer catering services as well. Please check out our tray and box lunch prices in the menu. All items ordered online will have 6.0% sales tax, and a $0.89 online order fee added to each order. Group Order Dine In Homepage Catering Menu Sign Up For Deals! Served with two spoons - built for sharing! Served with our vinaigrette coleslaw, pickle spear, and three bean bites. Order early for best selection. Baked fresh daily, limited quantities! Beans proudly serves Caribou Coffee & Coca-Cola Products. Served with choice of soda, juice, or milk, three bean bites, and chips. Monday - Saturday, 6:00 A.M. - 11:00 A.M. Welcome to Beans Cafe and Bakery! We started in late 2011. Our cafe and bakery offers some of the best food and drinks in Northern Kentucky. 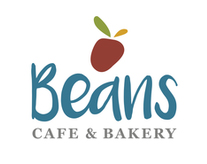 Beans is the favorite local stop for fresh donuts, homemade bakery goods, all-natural deli meats and cheeses, Caribou coffee, and UDF ice cream. More choices are available in our store! Our entire menu is available for Dine In or Carry out and while you are here check out our private room and book your next party or business meeting. We are located on Taft Highway, just off I-75 and US 25, just a few minutes drive from Grant County High School and the Ark Encounter.